Riverside guards Zach Dausch and Simon Weeren stop the drive of Loudoun Valley's Avery Nance, but pay the physical price. Friday night Valley won a physical game to retain first place in the Dulles. In a Dulles District showdown Friday night for first place, Loudoun Valley took the win against Riverside 75-63. The Vikings played their style of game from start to finish, and proved to be too much for the Rams to handle. The game got off to a sloppy start with plenty of turnovers early. Things started to settle down about halfway through the first quarter as the teams’ offenses got untracked, resulting in a 14-14 tie after one. The second quarter is where Valley shot into the lead with good defense leading to fast-paced Viking offense. Valley outscored the Rams 15-5 in the quarter, making it a 29-19 game at the half. The Vikings’ Trent Dawson controlled the ball and consistently found the Vikings’ open shooters. 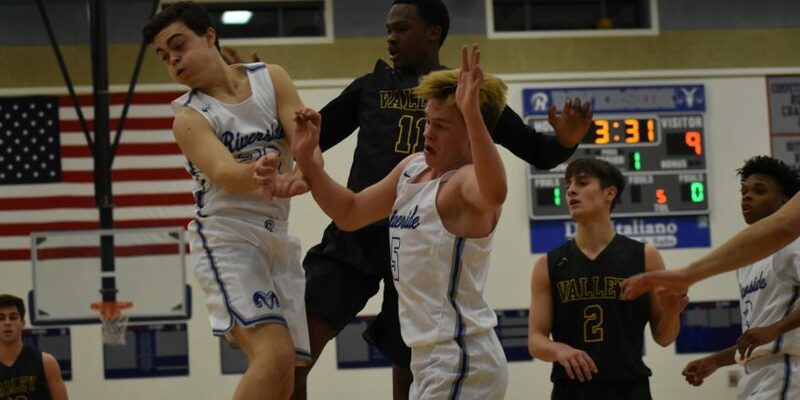 The third quarter commenced with a quick start by Riverside, but was succeeded by a 12-0 run by the Vikings that essentially secured the victory. 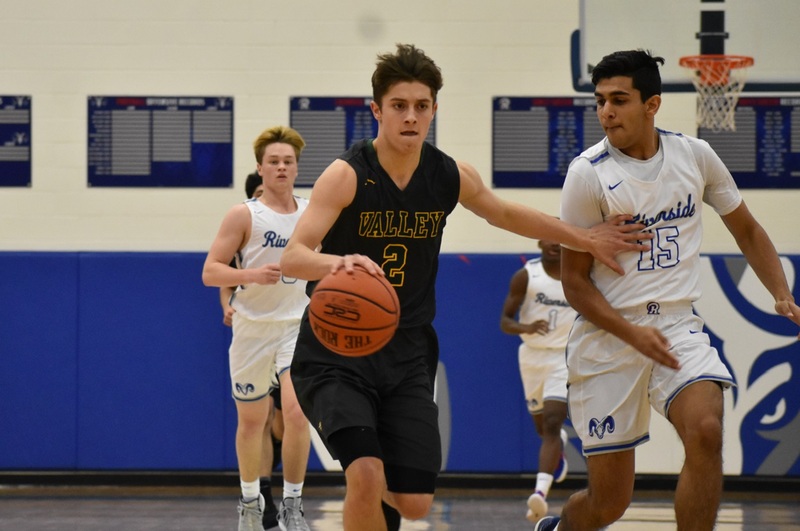 Senior forward Brian Barrett carried the Rams with eight points in the period, while senior guard Robby Adams had ten for Valley. Going into the fourth quarter the score was 53-38, and things got chippy from there as both teams were conceding fouls. Riverside pushed the ball but couldn’t gain the momentum needed to make a comeback. Loudoun Valley (5-0, 10-4) was led by Adams, who poured in 24 points. Junior guard Umayr Obaid added 16, while junior Avery Nance contributed 11. As always junior point guard Trent Dawson was key, controlling the ball and attacking the lane. He handled the ball well and found the Vikings’ shooters open as necessary, and added nine points. Loudoun Valley made eight outside shots at a high percentage which was a large part of their success. 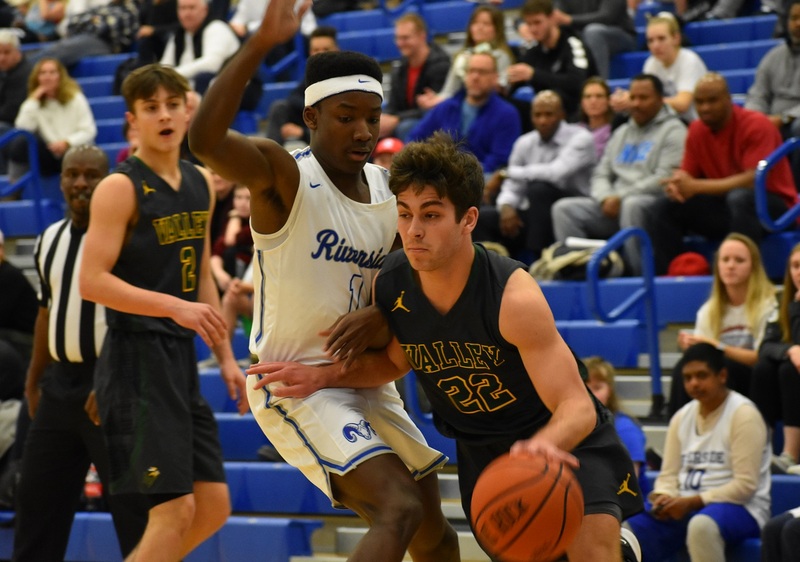 Loudoun Valley’s Robbie Adams (24 points) drives past Riverside’s Beau Everett. Riverside (3-2, 12-3) was led by senior guard Brett Asbury with 16 points, while Barrett and junior guard Beau Everett each contributed 12. Barrett was a constant threat down low, as well as hitting two threes from outside. The two teams will match-up again Tuesday, this time in the notorious home-court atmosphere of Loudoun Valley. Quentin James (point guard -Class of 2019) is 54 points away from breaking the All-Time Career Scoring record (1,601 points) at Lake Braddock Secondary. It was set by Hubert Davis over 30 years ago. He also may break the All-Time Career Assist record.